The Cisco 9506 Director raises the standard for director-level switches, providing industry-leading availability, scalability, security, and management. 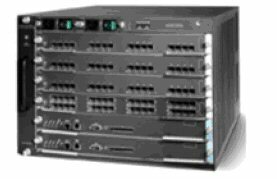 The Cisco MDS 9506 Series allows the deployment of high-end Storage Area Networks with lowest Total Cost of Ownership. Layering a deep set of intelligent features onto a high performance, open-protocol switch fabric, the Cisco MDS 9506 Director addresses the strict requirements of data center storage environments, providing HA, security, scalability, ease of management, and transparent integration of new technology. For pricing on new or used Cisco MDS 9506 switches, upgrades or parts, please contact Vibrant sales at sales@vibrant.com or call 888-443-8606 or 952-653-1700.